Fabric and foam hat in the shape of a Blue Tang fish from the tropical waters of the Indo-Pacific. Hat is one size fits most, up to a 22.5" head measurement. This hat is perfect for creating a blue tang costume that is quick and easy. This hat can also be used for shows such as The Little Mermaid. 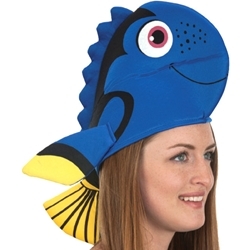 Pair this hat up with our other under the sea costume accessories.